The Auto Care Association announced yesterday the 2018 recipients of its annual Impact Award: Four for the Future, which honors four auto care industry professionals, age 40 or younger, who have demonstrated extraordinary leadership or have made remarkable strides within the auto care industry. The award was created in 2010 and is administered by the Auto Care Association Marketing and Communications Committee on behalf of the association, with support from the Young Auto Care Network Group (YANG). James O’Dell, Motown Automotive Distributing Co.
JR Bishop, director, marketing, Federated Auto Parts, plays a very active role in the auto care industry, serving in several different capacities including chair member, adviser and mentor. As the past chairman of Young Auto Care Network Group (YANG), Bishop led the group’s growth to more than 1,500 members since its beginning in 2014, as well as overseeing its most-attended leadership conference for YANG to date. Bishop also serves on the Auto Care Association’s board of directors. James O’Dell, manager, marketing, Motown Automotive Distributing Co., is making strides in the auto care industry, rising through the ranks of Motown to now being responsible for all of its marketing. O’Dell has completed the Leadership 2.0 program through University of the Aftermarket, and currently serves as vice chair on the Auto Care Association’s Marketing and Communications Committee, which reviews and suggests ways to better market the Auto Care Association and to enhance the communications program for internal and external audiences. O’Dell also is an active member of YANG. Nathan H. Shipley, executive director, industry analyst, The NPD Group, has spent more than a decade in the NPD’s automotive division of market research. In his current role as industry analyst, his in-depth understanding of consumer purchase patterns and trends in the automotive aftermarket has allowed him to work closely with retailers and manufacturers in the industry to help them better understand data and analytics and how to best utilize the information to run their businesses. Shipley has presented at the annual AAPEX trade show and other industry events by offering industry-specific trends and forecasts. Shipley also is a member of the Auto Care Association’s Market Intelligence Committee. John C. Washbish, director, marketing, Aftermarket Auto Parts Alliance, has played a very active role in the auto care industry over the years. Washbish contributes to growing the industry by bringing in new people and keeping them engaged by introducing them to the large network available to them through the Auto Care Association. Washbish is currently the chair of the Young Auto Care Network Group (YANG), a community of the Auto Care Association, for networking and professional development opportunities for young professionals in the auto care industry under the age of 40. Washbish serves as an active member of the Auto Care Association’s Education Committee, which works to enhance the business potential and competitive advantage of auto care industry professionals. Washbish also is a passionate supporter of the Auto Care Political Action Committee (ACPAC). 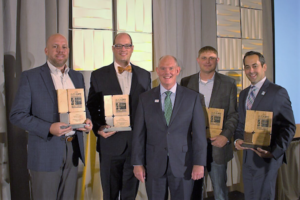 The four winners were formally announced by the Auto Care Association Marketing and Communications Committee during its recent meeting at the Auto Care Association’s Fall Leadership Days in Austin, Texas. The recipients will be recognized during AAPEX 2018 in Las Vegas and also will be featured in AAPEX Express and the Auto Care Insider magazine. For more information about the Impact Award: Four for the Future, visit autocare.org/impact.